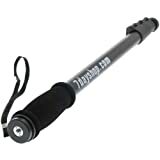 Uses 1/4 inch tripod screw fits 99% of cameras and camcorders – Supplied with a smart black shoulder case. Rest easy with this 7dayshop monopod. Top quality 4 section fully enclosed aluminium legs with quick release thumb clips for fast set-up and take-down times. Perfect for all camera types including DSLR etc. Ergonomic and comfortable foam grip handle (warmer to hold). Certain to improve your images especially when using heavy equipment or longer telephoto lenses over long periods. Weighs 360 grams and measures 54cm when fully closed or 170cm when fully extended (good for all photographers from 2 feet to 6 feet 4 inches tall). Get creative: Some people use monopods to provide an unusual overhead shooting angle – use with the cameras self-timer! Fits 99% of all camera and camcorders. Your equipment fits via a standard 1/4 inch tripod screw. Monopods offer superb support and more flexible mobility than a tripod. Especially useful in tight spaces or in crowds of people and where setting up a tripod would be impractical or even impossible on occasions. Because much of the equipment weight is taken off actually “holding-up” the camera, your efforts can be better used to steady/direct the camera instead. By using a monopod you will greatly reduce fatigue over longer periods and lessen the chances of camera shake, especially useful when using telephoto lenses. Very useful for sports photography and landscape work as they are also so much lighter and easier to carry around than a full size tripod – some even use their handy monopod as a walking aid over difficult terrain – clever idea ! Standard tripod screw fits virtually all cameras and camcorders. Supplied with a top quality and a nylon (dark green colour) case with easy and fast zipped access and also an adjustable carry/arm strap too ! Capacity up to 3.5kgs and the legs are manufactured from tough and lightweight aluminium section. This entry was posted in Discount Photography and tagged 170CM, 7dayshop, Aluminium, Case, High, Monopod, Quality, Section, Shoulder by Ball Photo. Bookmark the permalink.